“The Next Big Thing” is a blog hop in which authors around the world share what they’re working on by responding to ten questions. Wilkes faculty member Philip Brady responds to questions below. He was invited by Carol Moldaw, whose Next Big Thing post can be found here. To Banquet with the Worthy Ethiopians: a memoir of life before the alphabet. The phrase comes from Homer. It appears in both the Iliad and the Odyssey, and refers to the Gods’ habit of retreating from human affairs in times of crisis. But the idea for a long poem came in the Fall of 2010 after major heart surgery. The recuperation gave me months of time off from teaching and directing Etruscan Press and the YSU Poetry Center. Months off from real life of any kind, really. It also changed my relationship to my body. I was weak, dreamy. In many ways, I became a boy again. It was just like the endless afternoons I spent rocking in front of the hi fi listening to Irish music. I lived in Queens, and understood none of it. It was a way of sailing from the world—reveling in the higher nonsense; finding in rhythm a charm against time’s surge. Amidst the violent conflicts of boyhood, it was my way of banqueting with the Ethiopians. During the months recovering from surgery, sitting in my rocker in front of the fire, I felt again like that boy, rocking and chanting. And when I reviewed the many pages of the prose memoir I’d been struggling to write, they seemed so….prolix; prosaic; so slow and dense and stolid. After having been, briefly, dead, who’d care about all that stuff? And I remembered a summer in camp when I was twelve, trying and failing to read a prose translation of the Iliad by W.H.D. Rouse. Only now do I realize that it was the prose, not the story, that was difficult. And so I started to transpose my own prosy life into another key. There have been great movies about the Iliad and Odyssey. Some of my favorites are Ulysees with Kirk Douglas, Troy with Brad Pitt (mentioned in my poem), and Brother Where Art Thou with George Clooney. And of course various adaptations abound. But I remain an unrepentant John Wayne fan, pilgrim. What is the synopsis of your book? The tale takes place at the border between myth and time, between childhood and adulthood, between orality and literature. Following a heart attack, an aging ‘scrivener’ broods on a list folded in a copy of the Iliad. Item 265 reads simply, “Thersites,” a foot soldier whining to go home. The scrivener recalls the summer he first encountered the Iliad. Though overwhelmed by W.H.D. Rouse’s turgid prose, he gleaned enough to realize that the Trojan War, with all its violence and intrigue, was being waged on a smaller scale at his summer camp. To Banquet with the Worthy Ethiopians blends Homer’s discovery of the alphabet with a man’s recovery and a boy’s struggle to glimpse the adult world through the prism of an ancient epic. As the story is transposed from history into myth, it ripples from Ithaca to Queens, passing through a murder investigation, a hacked computer, an all-star poetry workshop, a plot to relocate Troy, and a committee charged with writing a sequel to the Iliad. While it is fantastical and whimsical, this is a deeply serious story about the difficulty of nurturing our personal myths in a world bound in time. I’m sending it around to all the usual suspects. It won’t be self published, nor will it appear from Etruscan, where I am the Executive Director. But as a publisher, I hope to be in a good position to work with whomever decides to publish it. Once I decided to write verse instead of prose, it came very quickly—eighteen chapters in as many months. In the beginning I was “translating” as much as writing—working from my own prose pony. I learned that the most telling difference between prose and poetry is pace. Verse moves at great speed, grounded only by a barely audible thrum. It illuminates without revealing—lightning flashing on a dark landscape. Some of the books that have influenced me are Christopher Logue’s War Music, Zachary Mason’s The Lost Books of the Odyssey, David Malouf’s Ransom, Margaret Atwood’s The Penelopiad, Alfred Lord’s The Singer of Tales, Julian James The Origin of Consciousness in the Breakdown of the Bi-Cameral Mind, Eric Havelock’s Preface to Plato, H.L.Hix’s As Much As, If Not More Than, William Heyen’s Crazy Horse in Stillness, Walter Ong’s Orality and Literacy, Leonard Schlain’s The Alphabet vs. the Goddess, and Jonathan Shay’s Achilles in Vietnam and Odysseus in America. I didn’t write the book. I composed it. The writing part is merely transcription, which I need to do because my memory isn’t strong enough to hold it all in. But now I have it. I compose and am composed, as I walk, or drive, or shower, or am pulled into the dark tube of an MRI. 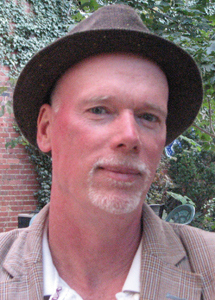 Philip Brady is a poet, instructor, and publisher. Learn more at his website: www.philipbrady.com. This entry was posted on February 18, 2013 at 3:40 pm and is filed under Faculty news, Faculty Posts, Interviews, Poetry. You can follow any responses to this entry through the RSS 2.0 feed. You can leave a response, or trackback from your own site.